In honor of the upcoming release of Shadow Study, we’re both reviewing Fire Study! Oh. My. Gosh. This book is exactly why I’m so obsessed with this series (and practically anything Maria V. Snyder writes to be honest). I was on the edge of my seat and SO anxious (in a good way) for the entire book. There was a lot going on in Yelena’s head and a lot of fear running rampant, and while there wasn’t much of Valek (swoon), it was still SO good. I love the sibling bond that Yelena and Leif are finally developing, it reminds me a lot of my brother and I. For some reason, I just can’t seem to be drawn into other books like I am with these lately, and while it frustrates me, it also gets me really excited. I’ve been trying to stay away from the Study Series for a couple of reasons – one, so that our readers are not bored with my constant love and comparison of every book to these ones, and two, so that I can find something else that I love as much. But, it’s just not happening. When I realized Shadow Study was coming out THIS WEEK I realized I needed to start/finish Fire Study so Lauren and I can read the new book together. That feeling that you get when you’re back in a world that you love so much, and reading something that you just ‘click’ with, is the best feeling ever, and that’s exactly how I feel when I read this series. I’m SO EXCITED for Shadow Study! Anyway, I gave Fire Study 5/5 on Goodreads because it’s really, really good. I love the story development and the writing, and the way that it made me feel. It might actually be my favorite in the series. Damn. 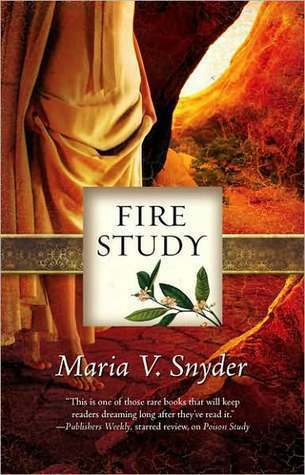 I’m so glad I decided to re-read this…it’s been several years since I finished Fire Study (and, at the time, thought there would be no fourth book…I’m so excited!). I remembered a few major things but for the most part, some plot twists were a surprise. My favorite character is still Kiki, the horse. She doesn’t have time for anyone’s sh*t, and will totally kick someone in the head if they mess with Lavender Lady. She is full of horse wisdom and her names for people crack me up. In fact, the way that the horses are treated in the Study series is one of my favorite things about Snyder’s writing—the horses aren’t just a transportation method for humans. Too often, the horses in fantasy novels and ridden extremely hard with little to no rest—something that would kill a real horse. The horses in Snyder’s books are cared for, rested, and groomed. It’s a little piece of reality that I appreciate (and a huge pet peeve of mine in other books). Poison Study is my favorite book in the entire series. Fire Study is alright, but Poison Study is the one that got me hooked on Snyder. Perhaps it was because I read Fire Study without reading its predecessors, but it is very quest-y and drawn out.